When I first met Mike Davenport, I felt like I was on a farm. As he ambled toward me, I was reminded of a dairy farmer I once knew in upstate New York: an easy gait carried him across the dusty road as the farmer went from his tractor to his barn, cows mooing in the field across the way. For Davenport, however, it was rowers and boats and an old hat that framed the gait of his lanky frame. The sun was high and hot the day I met Mike. He was gathering the rowers at The Gunston School in Centreville, Maryland, preparing them for their afternoon workout on the Corsica River. He approached the crowd of forty or so high school students and didn’t say too much. They quieted themselves in the sunshine as he stood, waiting patiently. Although he never expected it–or planned for it–Davenport’s career has been all about rowing. Nearly forty years ago, in the summer of 1978, as he was packing up his college apartment, having just graduated from Florida Institute of Technology (FIT), he was about to head out on his path to work as an oceanographer. Fortunately for the rowing world his college coach asked him if he’d coach the FIT novices one afternoon. You know what happened next. An afternoon of coaching turned into a coaching job. Coaching at FIT led to a chance to coach at the University of Central Florida, which led to a job coaching at the University of Albany. That coaching job led to a stint coaching the pre-elite national team, which led Davenport into the position of caring for–and rigging–the national team boats as the boatman for the team in the mid-1990s. Always itching to be in a launch, he moved to Maryland and took over the Washington College crew program, growing it into a powerhouse in Division III, winning multiple championships in the Mid-Atlantic Rowing Conference and earning several Coach of the Year awards. He never quite got around to that oceanographer's job, but he has put his degree to work, studying the science of our sport all along the way. Eventually, Davenport found himself at a computer, writing. Maybe it was his degree burning a hole in his pocket, or maybe it was his simple way of looking at a problem and seeing multiple options. Either way, I realized, as I watched him tinker with a shell in slings as the sun poured over his shoulder, Davenport is the kind of person who can’t help but teach, who can’t help but coach, who can’t help but write. 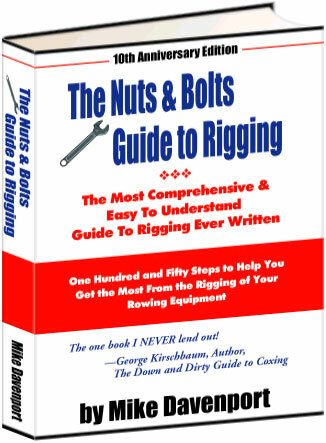 The Nuts and Bolts Guide to Rigging, known as the definitive book on modern rigging, started as a spiral-bound affair and has become the authoritative book on rigging. Davenport talks the reader through rigging sculling and sweep boats, equipment care, what tools are best, and how to gain speed through taking actions off the water. Specifically, he knows that by ensuring your boat is set up for the rowers who use it, actively monitoring your equipment and by having a firm understanding of the impact of the adjustments you make in your span, spread and pitch angles, you can bring efficiency to your crew. Davenport arms every coach and rower with the knowledge and experience he has collected over the past four decades. When he retired from Washington College last year, after 26 years of coaching the Shorewomen, it wasn’t long before he found himself back in a boathouse, organizing the dusty racks and preparing for the fall season at The Gunston School. Somehow, he can’t stay away from the sport that has been his entire career. I hopped in a launch with Davenport on a sunny afternoon and found myself awash in what comes naturally to someone who had been coaching for decades: zig-zagging between boats, adjusting one rower’s posture, educating a coxswain about turning in a windy funnel of land and water, and encouraging a novice crew that their rowing was improving, even on this, only their fourth day on the water. Davenport steers his launch and steadies a megaphone to his mouth as if he’s drinking a cup of coffee back in his home office. The launch is as much his “office” as any place, and the megaphone rests on his knee absent-mindedly when he’s not giving instruction to his coxswains and rowers. It’s a windy day and the boats full of novice rowers are bouncing on the waves. For two hours, this lanky man with a worn coach's hat calmly talks novice coxswains through turning into the wind, how to stay together even when one boat is faster than the others, and how to dock in the wind. He is calm and steady, and I can feel the trust he is already building among his coxswains, rowers and assistant coaches. He smiles a knowing smile. “I like to have rowers do the finger-tight rigging and coxswains go through with a wrench to tighten everything up.” I can tell, though, that the rigging Davenport is talking about having rowers and coxswains do is the race-day re-assembling of the riggers onto the boat, not the scientific rigging and adjustments he writes so much about. Those decisions and manipulations of equipment–the rigging a coach does for speed and efficiency–should be made in private, when the boathouse is quiet and the coach can step back and look at the needs of each rower specifically. Davenport’s work with rowing education hasn’t stopped. After being involved in USRowing’s coaching education program for ten years, he has continued developing content for coaches and rowers alike. His website, maxrigging.com, is a wealth of information for coaches, scullers, rowers and coxswains. He has authored several books on equipment care, equipment selection, rigging, rowing for efficiency and understanding your shell’s hull. He is a YouTube guru, with dozens of how-to videos on rigging, equipment care and even how to install a coxswain’s hammock. 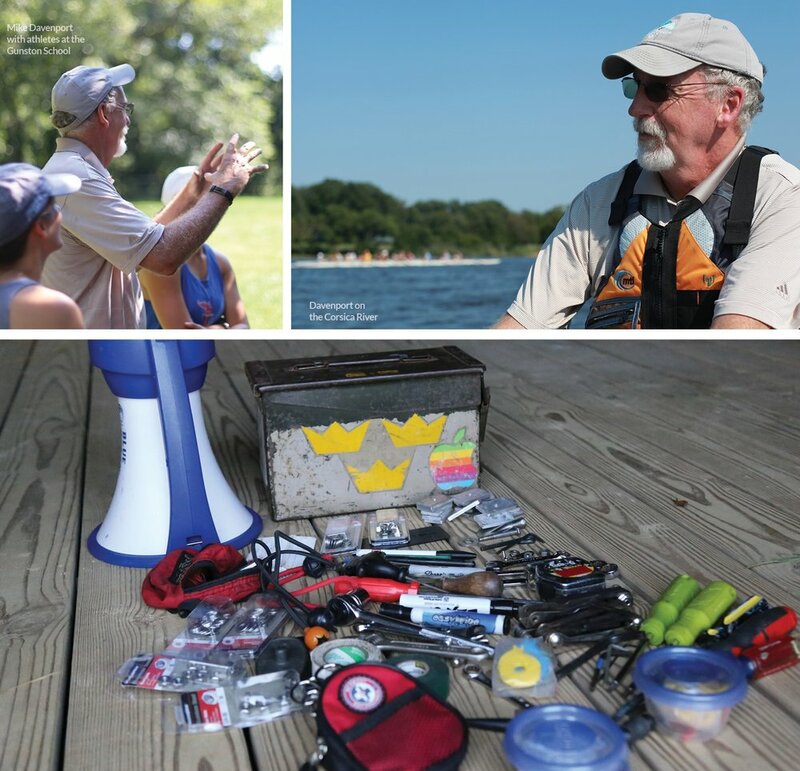 His website has one of the richest lists of blog posts on rigging and maintenance and he routinely travels to boathouses, sharing his knowledge through clinics. Davenport isn’t flashy. The feeling I had when I first met him comes through again when I ask him if I can see what his coach’s kit holds. He laughs–surprised I’d be interested–and dumps the contents onto the boathouse floor. We sit and talk about wrenches for an hour. Somehow, as the sun drops to the horizon and the wind subsides, I can feel his spirit come through those wrenches. Mike Davenport is a tinkerer, a coach, an educator. 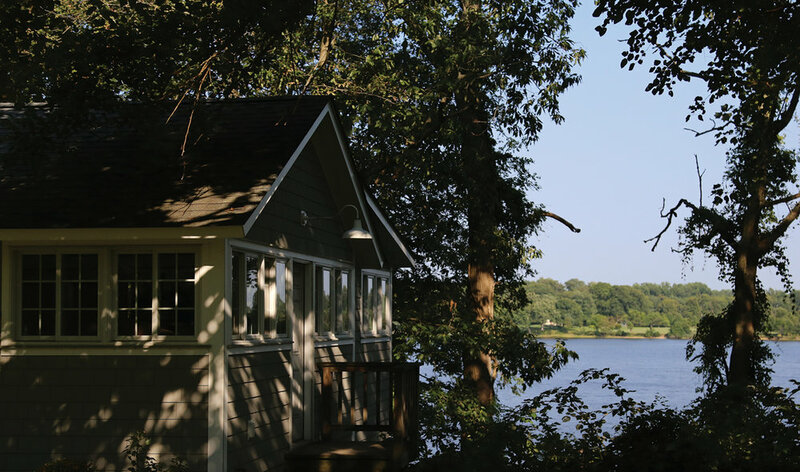 As the boathouse quiets, though, and we pack his tools back into his kit, I feel something else. There is a hesitancy in his movements. It’s as if the equipment is holding him, asking for his care. As I watch him reach for the lights, I see his gaze float over the oar racks. This man knows how to fix things. That knowledge is strong, and permanent. More from Mike Davenport can be found at maxrigging.com.